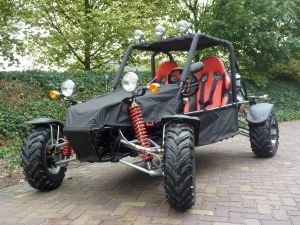 This buggy has a 4-cylinder car engine with direct injection. The engine is based on a Suzuki engine. The Dazon 1100cc is one of the few buggies with manual transmission, he has five gears and one reverse gear. The buggy has a transmission with differential, making it easy to go through all curves. Still, this buggy has enough power to go sideways through every turn. The Dazon 1100cc is also known as the Raider Extreme 1100 D.
As you may not know, the buggy is a German design, constructed in China.